Known Relatives: Motecuhzoma Xocoyotzin (allegedly the father of a previous incarnation of hers). Group Affiliation: Head of an unspecified religious organisation. Height: 5’5″ Weight: 120 lbs. Eyes: Brown (later blue) Hair: Brown or dark red. In her 1940 appearance, Nyola appears to be a resourceful leader, with ministerial training. But there isn’t enough material to go beyond these generalities. When she returned, Nyola was armed with a large, broad-bladed scimitar. She also seemed stronger than she looked. Though it may have been artistic exaggeration, Nyola could send a bound Hawkgirl tumbling back with but a backhand slap. Thick rain greatly cutting down on visibility. Lightning strikes that could harm even Earth-2’s Superman (Clark Kent) in 1942. Nyola was reputedly a reincarnated daughter of Montezuma. This likely refers to Motecuhzoma Xocoyotzin , who was the Aztec emperor during the early 1500s. He was the one in power when Cortés and his conquistadors rolled in. This era saw the fall of the great Aztec Empire due to a complicated mix of devastating plagues, political mismanagement, the anger of peoples conquered by the Empire, and Spanish meddling. Apparently, Nyola was heading a religious and political resurgence of imperial Aztec culture in Yucatán (we’ll discuss that). Most locals feared her and her cult. It may have been out of revenge for the book, which is what Chet believed. If so, Nyola decreed that Irene Norris would be a high-value religious sacrifice simply because it was convenient. It may have been because there was something special about Irene Norris, and Chet wrongly assumed Nyola’s plan was about him and his book. This seems more likely. Especially since Nyola stated that Irene knew about Aztec rites, and the Aztec kidnappers didn’t even scratch Chet Norris. Nyola came well-prepared. She had one or two enforcers with her, they all spoke fluent English, they had hypodermics filled with knockout drugs, and they brought sacrificial instruments. One was a sacred glass dagger, another a pail of water for ritual drowning. Their goal was specifically to kidnap Irene Norris, who was “a chosen of Yum Chac”. The operation was successful. However, they had to kill a witness through ritual drowning, and one of the enforcers left the glass knife behind in the confusion. When he returned to get it, he was arrested by Hawkman (Carter Hall). Nevertheless, Nyola sailed back to Mexico with her captive. Then they joined donkey caravans to Yucatán, as the sacrifice would take place in Chichén Itzá (?). For some reason, Hawkman followed all the way, considering he had to catch Nyola in the act (?). Once Nyola launched the ritual to sacrifice Irene Norris to the rain god, Hawkman swooped in (swooping is bad !) to rescue her at the last second. A local sheriff and posse, who had been warned by Hawkman, charged in and killed the Aztecs. To avoid capture, Nyola leapt into the sacrificial well – and possibly to her death. Now, some of y’all are probably going “wait, what ?” – especially our Mexican readers. Let’s explain. First, the trip from New York City to Yucatán involves crossing mountains. But it’s a detail and, hey, maybe the ways to reach Yucatán in 1940 were less than direct. Venial. “Yum Chac” is presumably a 1930s reference to the Maya rain divinity Chaac. When Mr. Thomas brought Nyola back, he corrected this to “Tlāloc” – the equivalent Aztec divinity. Chichén Itzá is a (major) Maya site, and AFAIK never was part of the Aztec Empire. Confusing the two is like mixing up Early Christianity Romans and Tsarist Russia, give or take. 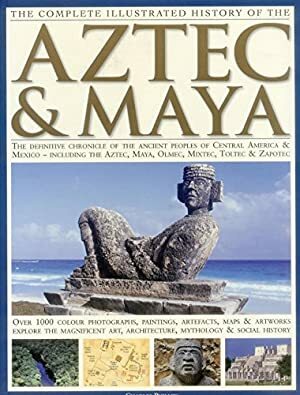 The Maya were a preclassic culture that lasted for a looong time, in what is now Southernmost Mexico and further South. Whereas the Aztecs were around circa the 15th Century, in what is now Central Mexico. 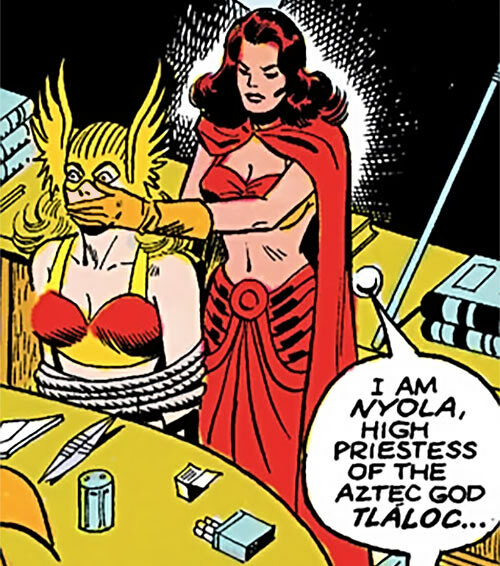 Our proposed No-Prize Hypothesis is that Nyola and her sect were a religious and political resurgence movement exploring the Mayan heritage found in Aztec myths. In this hypothesis, they were building a modern syncretism of the two. The likely did so using magic and memories from past lives. In this hypothesis, we could see her as a Mesoamerican equivalent to the theosophists . Maybe in the DC Universe she’s the one who popularised the “2012 Maya apocalypse” stuff. Nyola’s second appearance took place in 1942, though it was chronicled in 1985. But while she’s introduced as a foe of Hawkman, she seems to be a different character. She now has magic powers, seems motivated by greed, and is whiter than a shy Viking man’s buttocks in February. ¿Qué diablos? The Aztecs never intended to kill Irene Norris. In fact, the 1940 captions explain that the sacrificial maiden is expected to survive her ordeal. The reason why Nyola insists that Irene Norris is “the chosen of Yum-Chac” is because she has determined that Norris has magical potential. It is also the plain truth that Nyola is a reincarnated old soul. Thus, the plan all along is for Nyola to sacrifice herself so her old soul can possess Irene Norris. Which is exactly what happens, even with Hawkman’s interference. Thus, the Nyola we see in 1942 is Irene Norris’ body, perma-possessed by Nyola and identifying as Nyola. This combination is capable of wielding divine magic that is beyond what Nyola could previously do. Though not dominant, Irene Norris’ spirit is part of the gestalt . And she’s something of a material girl, which means that Nyola is now interested in stealing money. Perhaps Hawkman’s odd decision not to intervene until the sacrifice was taking place was because of the transmigration aspect. Perhaps he hazily intuited that Nyola’s ceremony had something in common with his own soul, and wanted to see its basics. In 1942, villainous worm Mister Mind accidentally ended up on Earth-2. If this sentence makes no sense, please see our article about the Earths and eras of the DC Universe. Mind assembled the first version of his Monster Society of Evil, a sort of anti-Justice Society of America. Among them was Nyola. She seemed in for the money, and for opportunities to sacrifice costumed heroes to her god. Nyola captured Hawkgirl (Shiera Hall), in part as revenge against Hawkman. Both women detested each other, so it is possible they had an unchronicled encounter before that date. The Monster Society repulsed an assault by Doctor Fate (Kent Nelson), Sandy the Golden Boy, and Hourman (Rex Tyler) – though Nyola lost her captive. They then stormed a prison to free the Dummy, whom Mind wanted on his crew. During that operation, Nyola stunned Superman himself with her summoned lightning. However, the Monster Society members grew tired of Mister Mind. Nyola and her colleagues Ramulus, Mister Who and the Dummy started organising. When Mind revealed that he intended to conquer the world, they mutinied. They somehow summoned Oom the Mighty, a former Monster Society member who was more powerful than even Mind. However, Oom then declared himself the leader. The pragmatic Nyola realised that they had little choice but to obey him. 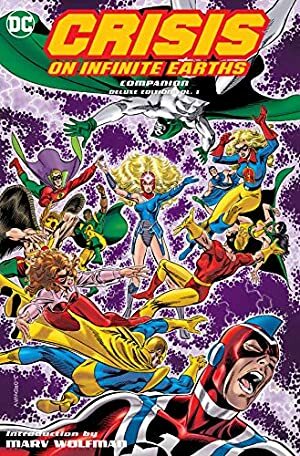 Oom decided that they would frontally attack the All-Star Squadron, in their headquarters. He forced the Monster Society to follow him. Nyola started blanketing the area in a storm, but a batarang prevented her from gesturing to cast spells. She eventually freed herself, but by that point the situation was FUBAR. 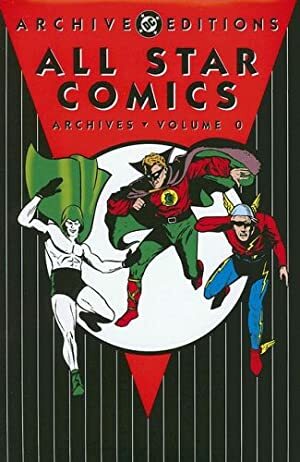 The Dummy convinced Green Lantern (Alan Scott) to destroy Oom before he’d kill everyone. Mister Who, Ramulus and Nyola apparently made their exit in the meanwhile. In 2015, we glimpsed a flashback set in an unclear version of Earth-S. 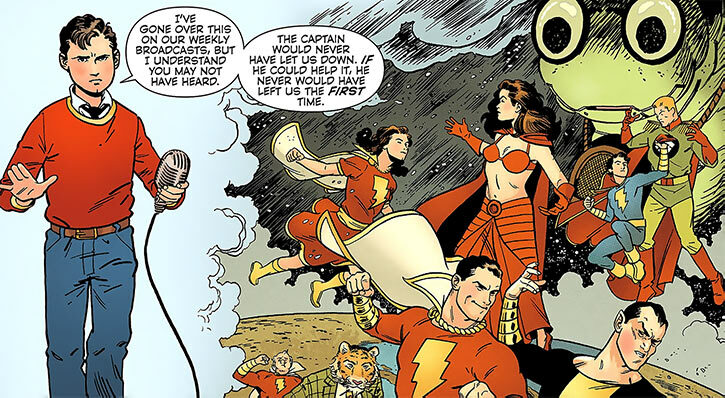 It depicted Mister Mind, Captain Nazi, Nyola and Black Adam as old enemies of the Marvel Family (Captain Marvel (Billy Batson), Mary Marvel, Captain Marvel Jr., etc.). The 1942 version’s skin tone seems redder and more tanned than Hawkgirl’s, though that’s not consistent. Her hair colour evokes henna dyeing, though there’s no reason why it couldn’t be natural. 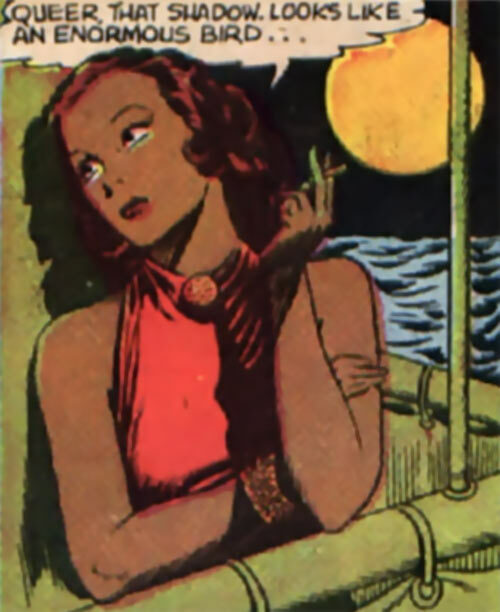 In her 1940 appearance we can see that she’s a clever leader and pious about “Aztec” divinities. And that’s about it – these were short stories. In her chronicled-in-1985 appearance, she seemed pragmatic, greedy and to be something of a bully. But she gets little screen time, so it’s hard to be more specific. Though she was interested in human sacrifice she didn’t kill random opponents such as police. Presumably, it has to be done ceremonially or it’s worthless. Credentials (An undefined Aztec polity, High), Expertise (Aztec theology), Languages (Spanish, Nahuatl). Dagger [BODY 03, Enhance (EV): 01 (cap is 05), Descriptor: Piercing]. The 1940 stats above are arbitrary, due to lack of material. It’s just thrown in in case somebody needs ’em. Air control and Lightning can only be used if suitable weather conditions are present (high winds and charged clouds, respectively). Lightning attacks strike vertically. This allows for Indirect attacks, but usually prevents their use too far indoors. Weather Control doesn’t allow for wind- or lightning-based attacks. Scimitar [BODY 04, Enhance (EV): 02 (cap is 06), Descriptor: Slashing, bludgeoning]. In 1942 Superman hadn’t been established as being vulnerable to magic, so Nyola needs strong APs of Lightning to affect him like she did. I’m assuming she also spent Hero Points. See our Superman as of 1942 stats for more. *However*, Roy Thomas is using an early 1980s retconned version of Earth-2 1940s Superman. This version is retroactively vulnerable to magic. Frex, he cannot breach the magical barrier around Axis countries. The exact level of vulnerability isn’t consistent, though. Thus, it is likely that she actually has lower APs of Lightning (07 ?). But that depends upon how vulnerable Superman should be to magical lightning at that point. Of course, this *assumes* that Nyola’s weather control is magical in nature. 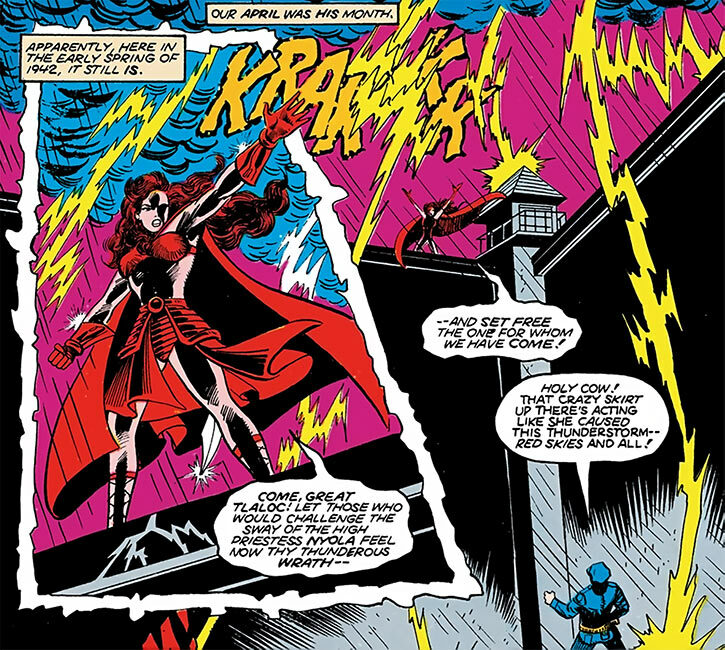 It could be a Storm (Ororo Munroe)-style metahuman power that Nyola sees as a divine gift for religious reasons, but isn’t magical per se. The Occultist score is largely based on the *assumption* that she played an important role in bringing Oom back. And the STR is arguably highballed by 1 AP since that makes her more interesting. Generally, it’s all quite speculative. Source of Character: DC Universes. Writeup completed on the 7th of June, 2018.